a Japanese home baker living in Belfast. 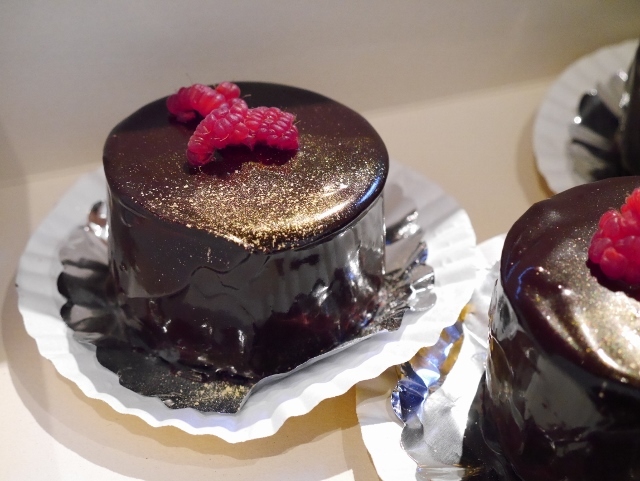 I made these mousse cakes some time ago, but this is the perfect opportunity to write a post about it. Something special for Fiesta Friday Anniversary Party Part 2! It was an order from a friend for hen party. 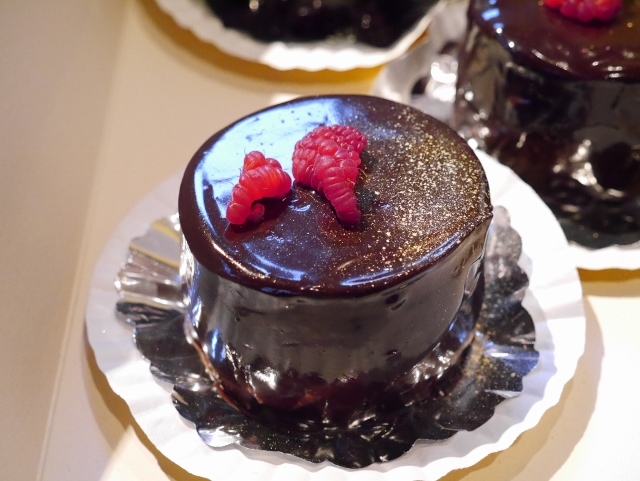 She wanted individual, mousse or cream cakes which she would find in Japanese cake shops. 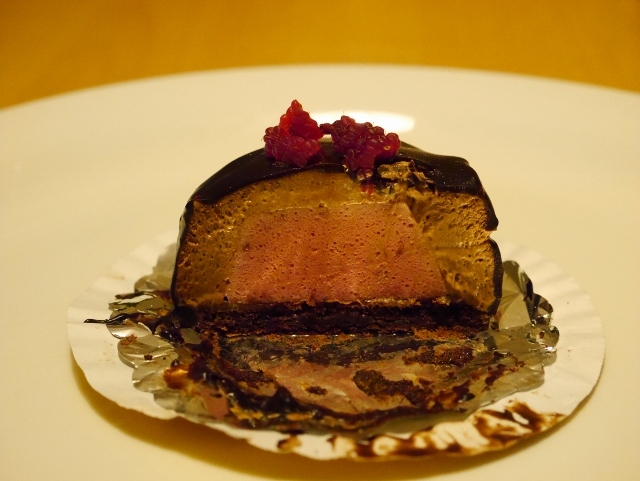 I thought and thought, and came up with an idea for pink and chocolaty cake, something special and elegant. When I discussed this idea with a friend who ordered those cakes, she told me that bridal theme color was black. Dark chocolate coating of the cake fitted perfectly! 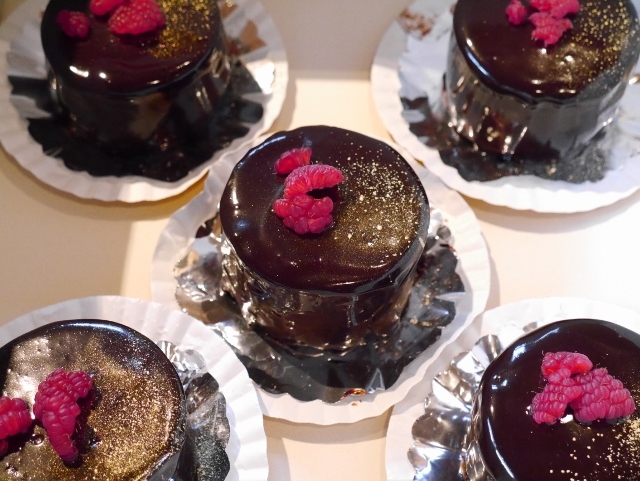 Base was thin flourless chocolate cake, topped with tangy raspberry mouse, then chocolate mousse, coated with dark chocolate coating. I used gold shimmering powder and broken fresh raspberry on top. I love sharpness of berry with sweet chocolate. These combination will be the one I cannot resist in Japanese cake shop. Another big THANK YOU, for hosting this big Fiesta Friday Anniversary Party, Angie and this week’s co-hosts, Selma @ Selma’s Table and Nancy @ Feasting with Friends. I am looking forward to seeing lots of main course and dessert this week. Yum! These are so pretty and elegant. I imagine your friend and guests were thrilled. These are the perfect contribution to celebrate the Fiesta Friday anniversary! They look so elegant and I imagine the flavors are delectable. 🙂 Thank you for sharing your delicious recipe with all of us at the FF party! You went a step further for what is already a decadent cake, making it more special by sprinkling gold. Subarashii! ありがとうー！I thought a tiny bit of gold leaf paper will be good, but I couldn’t get it this time, so I used gold shimmer powder. It gave enough a shine to a cake fit for hens! So pretty, I bet they were so yummy too! These are cake shop perfection- impressive!! So elegant & lovely.